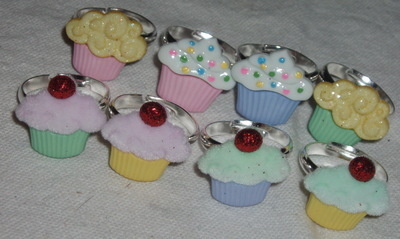 Cupcake Ring, Pretty Cupcake cabochon securely glued onto a sliver plated childs size adjustable ring blank. Cupcake cabochon securely glued onto a sliver plated childs size adjustable ring blank. Ring colour chosen at random. Such fun to wear and very pretty, just what all the little fashion divas want.